The impact of roadway closures during phases of the project is a concern to local businesses. Credit: Matt Skoufalos. 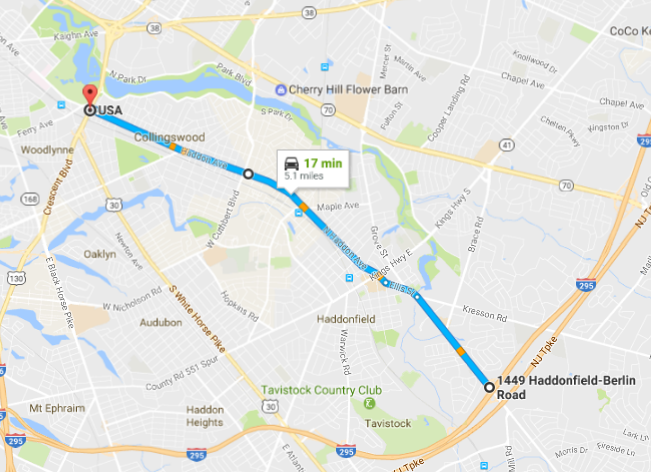 The major local artery will be resurfaced from the Cherry Hill 295 on-ramp through Haddonfield, Haddon Township, and Collingswood. The project will be in development for 2017 with work to follow in 2018. Approximate length of the 5-mile Haddon Avenue roadway project. Credit: Map data (c) 2017 Google. Haddon Avenue is headed for a major overhaul, and local leaders are already bracing to absorb the impact of one of the biggest infrastructure projects to hit the region in years. Plans for the work, which will include designing, milling, and resurfacing approximately 5 miles of heavily traveled roadway (from the CR-561 exit of I-295 to Route 130) are slated to be developed this year, with work to commence in 2018 and beyond. Although the roadway itself will be paid for by the Camden County government general fund, the communities it’s cutting through—Haddonfield, Haddon Township, and Collingswood—are preparing to coordinate the work with vital repairs to their 100-year-old water and sewer lines. In Collingswood, Mayor Jim Maley said his biggest concern is supporting Restaurant Row, the central attraction of the borough downtown business district. Since the late 1990s, the municipality has enjoyed a dining-centric economic turnaround built atop an aged infrastructure that has been overtaxed by its success. Haddon Avenue in Collingswood. Credit: Matt Skoufalos. Years ago, Collingswood had considered redesigning Haddon Avenue to incorporate a tree-lined median, but the 33-foot, two-lane roadway can’t cede much width, and businesses in the district depend upon keeping their available parking volume. Similarly, any consideration of widening the sidewalks downtown would be further complicated by the placement of existing shade trees, Maley said. The limited area will also scuttle any thoughts of adding bike lanes to Haddon Avenue in the downtown district; instead, Maley said bicycle traffic will most likely be routed to Atlantic Avenue, which runs parallel to Haddon Avenue beneath the PATCO Speedline rail. The biggest benefit the borough expects to get from the project is the opportunity to make pedestrian improvements, which Maley said will happen “slowly over time” because the underground infrastructure work “is going to cost a fortune. 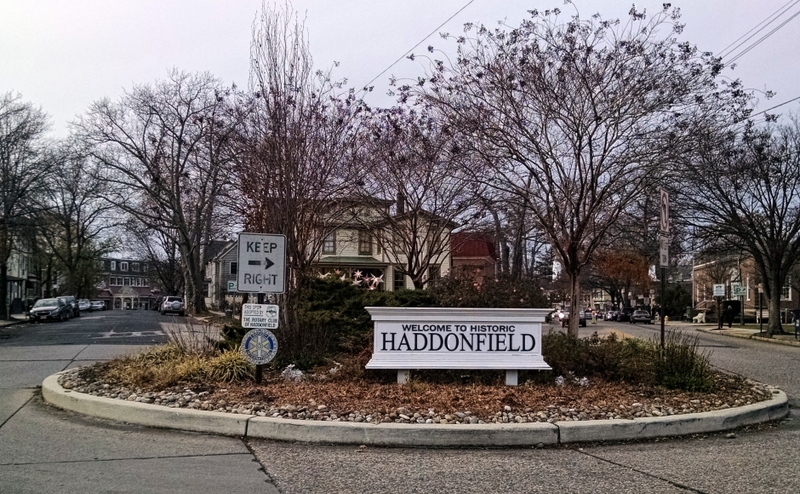 Haddonfield Mayor Jeff Kasko said the borough will focus on beautifying the approach to the center of town during the roadway project. Credit: Matt Skoufalos. In Haddonfield, where roadway improvements will stretch from the Cherry Hill border to the Haddon Township border, Mayor Jeff Kasko said his community will focus on improving streetscaping from the Little League fields through to Rotary Circle at Ellis Street. Kasko said officials are looking to “upgrade the look” of the borough gateway and beautify its surrounding approach. “We’re trying to make it more pedestrian-friendly and more aesthetically pleasing as an entrance into town,” he said. 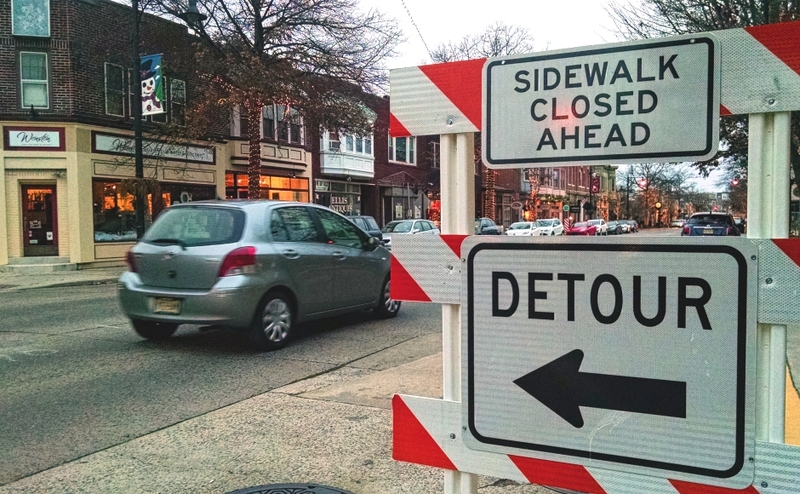 In Haddonfield, the rest of the street project will coincide with infrastructure repairs beneath, but since the borough completed the sale of its water and sewer system to New Jersey American Water (NJAW), the cost of its upkeep will not be borne by the local government. NJAW will replace or repair old pipes near the center of the borough business district and in stretches along the remainder of Haddon Avenue towards Haddon Township, Kasko said. The mayor doesn’t foresee any extra pedestrian improvement work ahead for a street that he said is “pretty walkable now” throughout the borough; however, there may be more to address in the area of North Haddon Avenue to upgrade pedestrian crossings near the higher-car-volume Haddon Avenue border. 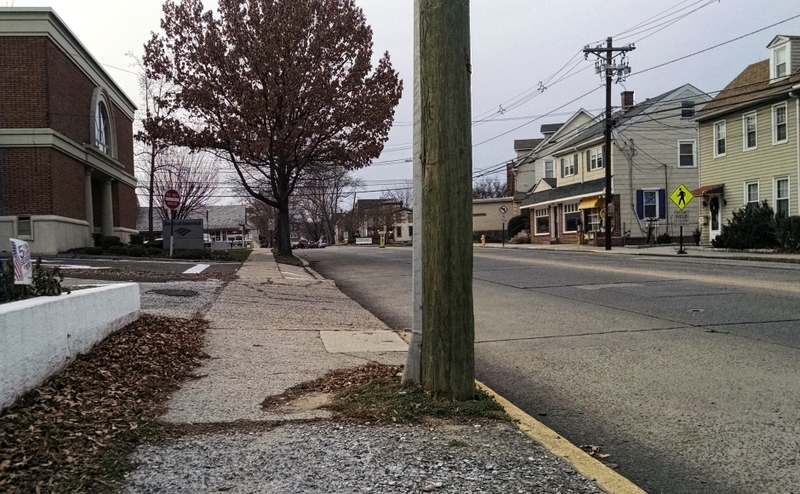 Where Route 561 enters Haddonfield, the borough is looking to address its streetscape issues. Credit: Matt Skoufalos. “I know a number of people who, in the nice weather, would rather ride their bike even if they’re going to Treno or the Irish Mile,” Kasko said. “You want to make it more friendly for that and more safe for that, and then hopefully take a few cars off the road, which I think is good. Haddon Township Mayor Randy Teague said his eye is on the same underground infrastructure issues that his peers are examining. 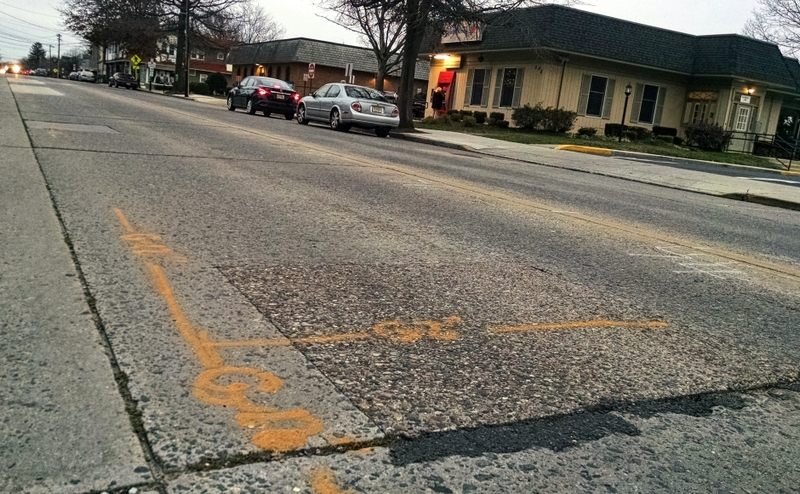 The mayor said the Haddon Township Department of Public Works will scope the water and sewer system and work out its own plan for the rehabilitation or replacement of its 100-year-old components while the roadway is renovated above. “It’s going to be a major undertaking, but the timing is right,” Teague said. “Our only concern is the age of the system. We’re going to deal with it in a proactive manner and complete the infrastructure on our terms rather than wait for emergencies to occur. Once the Haddon Town Center Project is completed, developers Fieldstone will address the streetscape. Credit: Matt Skoufalos. As part of the Haddon Town Center project, developers from Fieldstone will complete the Haddon Avenue streetscape along their side of the roadway; Teague said the township is examining the cost to complete the opposite side of the street as well. He doesn’t believe any of that work will create additional street parking, but said the township government is “still looking” for ways to create extra spots in the central business district. The biggest concern in Haddon Township is the impact of the work on downtown businesses as construction progresses, Teague said. He recalled that repairs depairs done by PSEG to renovate gas lines along the avenue “was a significant disruption” to the local economy, and that project was “nowhere near the level of what a complete road rehabilitation will be. Teague said township commissioners are “open to anything that improves Haddon Avenue,” and that the local government would encourage residents to do whatever they can to avoid vehicle travel during the project. “The least amount of cars on Haddon Avenue, the better,” he said. “As much walking as we as residents can do, the better it will be. Haddon Township Mayor Randy Teague said he is concerned of the impact of the road project on local businesses. Credit: Matt Skoufalos. “Infrastructure is not something that’s glorious, and most of the time it is a very large inconvenience to the residents,” Teague said. Camden County Freeholder-Director Louis Cappelli said the county government will work to be “as transparent as possible” throughout the project, offering public notice as the work progresses in phases, and managing signage and detour information. Cappelli said the investment in the local infrastructure will beget additional business development as well as supporting residential accessibility to one of the main local thoroughfares in the region. 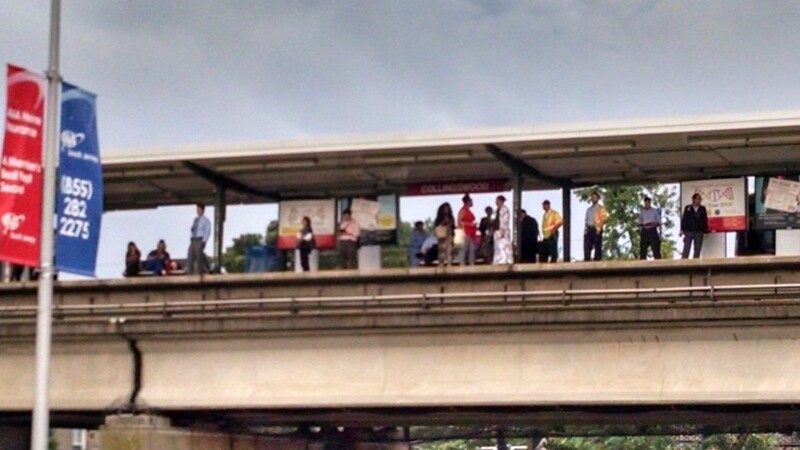 PATCO riders in Collingswood stranded during a summer storm. Credit: Matt Skoufalos. Cappelli also said the updated infrastructure will lay the groundwork for future mixed-use development along the PATCO Speedline stations, and that the improvements will be a further incentive to private investors who may consider pursuing such projects. 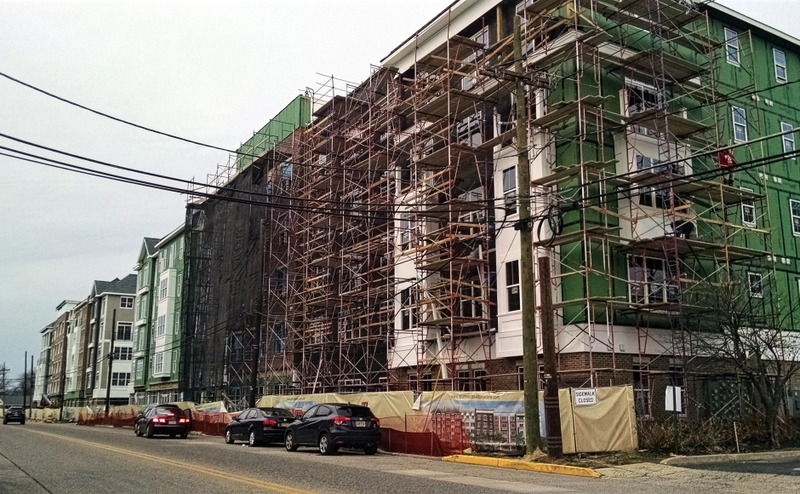 “We want to make sure that any development along Haddon Avenue helps increase access to PATCO line and improves accessibility to new development along the PATCO corridor,” he said. 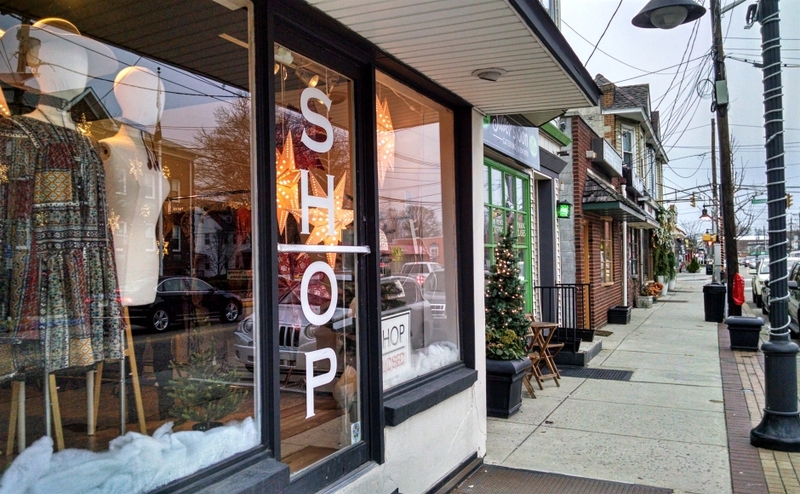 Next Article From Hooked to Assemble: Fabric Arts Business Expands on Haddon Ave.